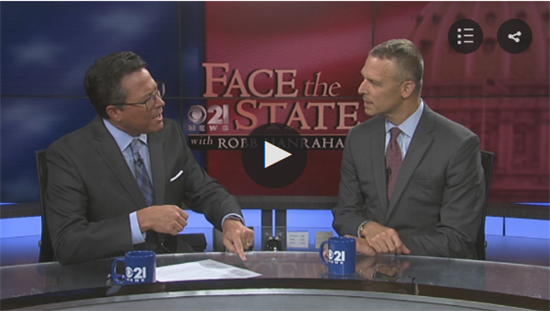 Perry discusses his stand alone proposal, H.R.6438, DHS Countering Unmanned Aircraft Systems Coordinator Act, which regulates unmanned aircraft and drones on CBS 21’s Face the State with Robb Hanrahan on September 23, 2018. Washington, D.C. - The House of Representatives has passed H.R. 302, Federal Aviation Administration (FAA) Reauthorization Act of 2018, providing certainty for our Nation’s air travel industries, and directly benefitting our economy and consumers. “The reauthorization is big improvement for anyone who flies. Not only does it correct existing troubles within the industry, but it’s also extremely forward looking, incorporating a regulatory framework for drones, space ports and supersonic travel. America is the birthplace of aviation and with proposals like these, we’re going to continue our international dominance in this arena for generations to come,” said Perry, who supported the bill. The legislation updates federal policy to increase consumer protections, including an established minimum seat size for passengers, banning the use of cell phones and e-cigarettes while flying, banning the practice of putting live animals in overhead compartments, and banning the "bumping" of a boarded passenger from being removed to accommodate another. Incorporated within this must-pass legislation are key provisions authored by Congressman Perry regarding unmanned aircraft; i.e., "drones." Perry’s previous drone proposal passed the full House as a standalone measure earlier this month. Inclusion in the FAA legislation is significant because it likely will be signed into law, and contains a broader policy framework to allow innovative technologies to flourish and benefit the consumer. Perry’s proposal creates a process by which the FAA may allow deliveries via unmanned aircraft systems in a safe and appropriate manner while protecting the consumer from intrusion into private space. It also establishes the regulatory framework where the Departments of Homeland Security and Justice may protect critical infrastructure and widely attended events from security risks posed by drones. The Federal Trade Commission is authorized to protect consumers from privacy intrusions by commercially operated drones. The bill contains provisions to incorporate concerns from state and local municipalities as the technology becomes more widely used. Congressman Perry also worked with Congressman Lou Barletta on language to improve technology and transparency, which requires the FAA to create a website so that applicants seeking waivers for certain uses of unmanned aircraft – i.e., flying at night, beyond visual line of sight, above 400 ft., etc. – may receive real-time status updates about their permits (approved, denied or in process). The bill now awaits consideration by the the Senate.